Iconoclasts are back at it again. Growing out of distaste for the Confederate Battle Flag flying by the South Carolina capitol, this has extended to other symbols or putative symbols of the Confederacy: statues, license plates and even state flags! As a non-native Alabamian, I'd like to inject my point of view. I moved to Alabama as a student in high school, and later went to Auburn. Yeah, I know; but it was a nice place, and I came to like it and Alabama very much. So much that I went to Huntsville to live afterwards, working in aerospace. One of the things that I've noticed about natives and people with long-term ties to the state have in common is a kind of defensive pride: when you run down their state and its history, they don't take it very well. Part of that is the fact that they've heard that old song before; and they get the message that they're somehow low-bred and common. That is what causes that reaction, "Love it or leave it." Or as Lewis Grizzard put it very well: "Delta is ready when you are." It's considered ill-breeding down here to come into someone's house and criticize his or her dog. That's plain and simple. No, this is not paranoia from a transplanted Ohioan gone Southern: I just see it from my peoples' point of view. Probably we should play down the Confederate flag. But the outside critics in the media go overboard, as usual. The example that comes to mind is the state flags of several Southern states. One source (Christopher Ingraham in the Washington Post attributed the source of the design of seven Southern states to symbols of the Confederacy. 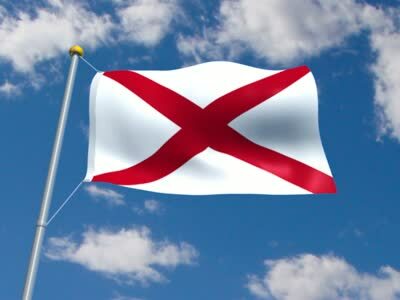 Example 1: the Alabama state flag. People, it's a red St. Andrew's cross on a plain white background. Unless I'm color blind, the Battle Flag had a blue cross with stars on a red background. Example 2: the Florida state flag. It's a plain red cross with the state seal in the middle. 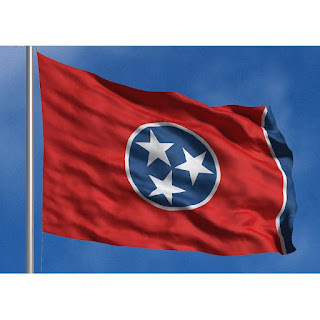 Example 3: the Tennessee state flag. It's a red flag with three stars in a circle in the middle to represent the unity of three sections of Tennessee: West, Middle, and East. Mr. Ingraham got bothered by the blue stripe as being suspiciously like that on one of the later Confederate flags. Example 4: the Arkansas flag. One of the four stars in the diamond allegedly represents the Confederacy. Oh really? As for the Georgia flag, it just looks like the original stars and bars but with a boring state seal instead of stars. Mr. Ingraham also fretted about the date of the Mecklenberg Declaration on the North Carolina flag, but he really just ran with assumptions all over the place, as it was back in 1776! Yes, you can say that Mississippi has a Confederate flag on its state flag. But Mr. Ingraham tended to reach dubious conclusions on all the others. At least he didn't make something of Louisiana's pelican or the Lone Star flag of Texas. That one predates the Civil War. But his article, in addition to being sloppily researched, seems to contribute primarily to cheap Southern-bashing and shoring up dubious claims to East Coast superiority. But it may contribute to anxieties that some of them have when they go down South. Would it cause them to worry about a Confederate boogeyman hiding under their beds? And they don't mind the monuments to the likes of terrorist William Sherman, genocidal Philip Sheridan, or Ulysses Grant. I like girls in bikinis. I think most girls look better wearing one, rather than those one-piece jobbies from the 1940's. And the shorter, the better. But why must some spoil the effect by getting a lower back tattoo, A.K.A "tramp stamp." Does not the popular term carry any significance? N0, better to go with a nicely tanned, unadorned back. No butterflies, birds, abstract designs, religious messages. And if you go with a thong (okay in a few places), leave well enough alone! They don't come lovelier than Anna Kournikova!